Very attractive variety with large trusses of deep pink flowers contrasting with a dark green foliage. Will flower constantly until late frost. Produce good size berries with a hint of wild strawberry flavor. 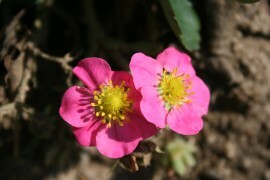 Will fit perfectly in a rock garden, an ornamental bed, a balcony or hanging baskets, because of its vigorous growth. Perfect for the Urban Farmer.